There Are People Who “Like” Romance Books, And Then There Are People Who “LOVE” ROMANCE BOOKS. There may not be a visible difference between the two, but the people who “LOVE” them are a whole different breed then the people who simply “LIKE” them. 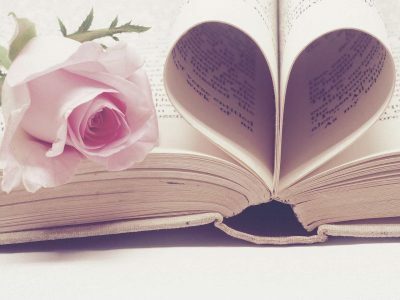 For people who love romance novels, a new paperback is their holy grail; the scent of turning pages is their ambrosia; and they may just choose a good book over a night out any day of the week. If it is possible that any of the following scenarios could happen to you, you might just be a love story addict. So, picture it: That gorgeous cutie you have been silently crushing on for weeks finally comes over and asks you out. Your heart is fluttering; your excitement meter rockets to 101. Then he tells you he wants to take you to a movie, but the movie is one based off one of your favorite romance books of all time. You really like this guy, but you can’t take the risk that the movie will destroy your favorite book for you, so naturally, you tell him no, go home, and re-read that love story you love so much. It’s Saturday afternoon, and your favorite little niecey’s first ever dance recital is coming up in an hour. She is so excited; she has been practicing all month. Your sister just sent you a picture of her in her tutu, and she is so stinking cute that your heart just about melts right out of your chest. But… you just can’t go. You’ve been reading the best love story you’ve read in months, and the main characters are finally about to kiss. If you put the book down now, you won’t be able to pick it up again for hours. Unacceptable. So, you pick up the phone, fake a very convincing cough, and tell niecey how very sorry you are and that you promise you’ll make the next show. Then you make yourself a hot cup of tea (for that imaginary tickle in your throat) and settle in for the climax moment you’ve been waiting for since page one. You loved high school. You were SGA President and runner-up for Homecoming Queen two years in a row. High school was a great time for you, and you loved the people with whom you graduated. Unfortunately, the day of the reunion just happens to coincide with the release date of the final book in a romance series you’ve been reading since book one. You’d really, really love to go see your old friends, and especially an old boyfriend or two, but Books A Million is calling your name. Oh well. There is always your twenty-sixth year reunion to look forward to! If any of the above three scenarios is one that you could easily see yourself being a part of, you might be addicted to your romance books. It’s okay, though. It’s a great addiction to have!